Discussion in 'Black Hat SEO' started by SonOfMan, Jul 13, 2015. I know I have seen it done on review sites or sites that just have the occasional affiliate product review. I don't want to lose adsense, would it be safer to have a second site where all the affiliate stuff is done on. Like say Site A has all the fun content where it has adsense but to learn more click here and then it goes to my review site. I have heard that the Big G bans people for a lot of different things and I don't want to do anything to jeopardize that. Any feedback or experiences, I would appreciate. Its mainly viral content for Site A. This is my first site where I am trying to monetize and would like to keep everything about the board, but without directing visitors to some sort of affiliate I just feel like I am leaving money on the table. Hi, I think this is a tricky situation that you are in and if Google catch wind of it they will not ban you but they might just deindex your sites from its search engine result. If you are to do this I would say do not do this excessively to where it is obvious. Google does frown down on sites that think that it is trying to "Game its System" so to speak even if you think that your site is not. 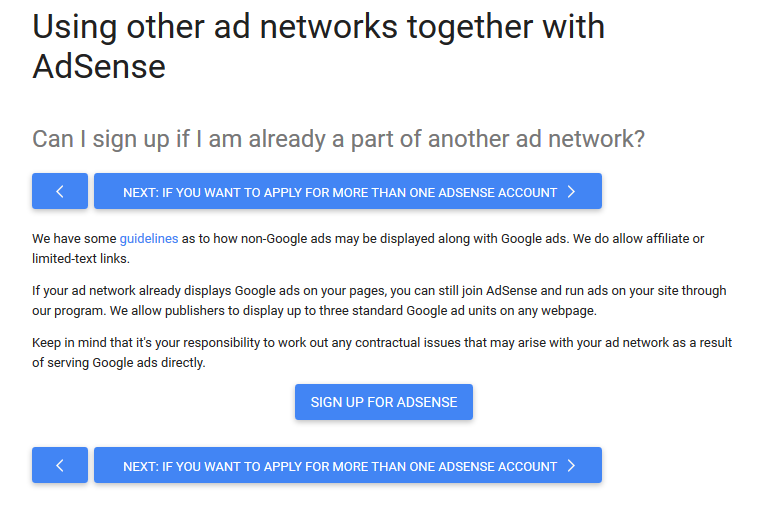 From my experience Google tends not to like affiliate programs because of its history with dealing with "spam", and if your adsense site is linking to a site with excessive affilite links they might just remove adsense from your original site. Just a little advice. It's not tricky, if you have real content (not too "thin"), it's fine to put affiliate links plus adsense, never heard anything against that. Affiliate networks are best, But its depend on niche, find other sites in your niche and see how they are monetizing. or simply split test both. I agree with Hawkster. Depending on your niche, Adsense will make you pennies, while affiliates can make more if the audience converts. Thank you for the better clarification . I was referring to hooking up your adsense site with thin content, affiliate link spam, that type of stuff is what damage your site. Thanks for the replies, its mainly an entertainment viral type of site so the content is pretty thin and this type of site conversions aren't really in the game plan, its mostly no follow so SEO isnt really a top priority but a good standing with adsense is important. But I am thinking that some of those that come to the site legitimately might like to learn more about it.